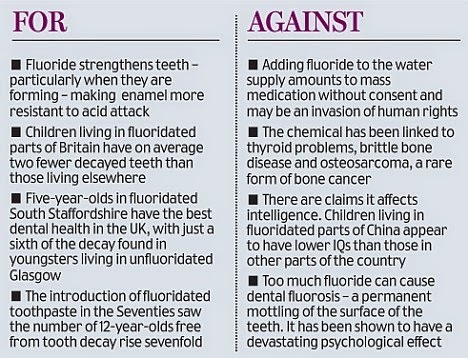 I've heard about the danger of fluoride in our toothpastes for a long, long time but never bothered to give it much thought until recently. We get bombarded with so many health issues in our everyday products and food nowadays that it just seems with a blink of an eye, something else pops up. I do try to live an organic lifestyle. I narrow down what I buy for my family based on my rule of thumb: How Often I Use/Eat It? If I use a product daily, then I buy organic. I always read the ingredients label. Examples of stuff I buy organic are moisturizers, milk, eggs, soap bar, shampoo, certain fruits and vegetables. A chain of events led me to start looking into the health affects of fluoride. A year ago, I overheard or more like eavesdropping, on two guys talking about fluoride toxicity at a health food store. These guys weren't just rambling like "oh this stuff is bad for your teeth". They spoke a bit about the history of fluoride and the abundance of it. Gosh I wish I understood more of what they said just like how when you listen to lawyers talk, it's like a completely different language. Even though I didn't understand much of the medical jargon, it was perfectly clear to me when the guy said "this stuff will poison you slowly". After the eye and ear opening information I heard at the grocery store, I didn't stop using fluoride toothpaste. I just didn't have the time to sit down and read about what's so bad about fluoride. I guess I believed that since the government tested and approved fluoride to be used in toothpastes and water, it should be safe. Besides, the water in San Francisco is fluoridated for nearly 50 years. There was an extensive study on water fluoridation which was published in the October 7, 2000 issue of the British Medical Journal showing no clear evidence of adverse health affects other than dental fluorosis which changes the appearance of the tooth enamel. In mild cases, you get white specks or streaks on your teeth. In severe cases, pitting, brown stains, and mottling of the teeth. Last month, my friend told me a story about how her teeth remineralized. Teeth remineralization is another topic I've heard about too but didn't care about. She told me her dentist urged her to get the cavities fixed because she had been putting it off for a year. She said within the year, she changed her diet to include hard cheese, milk, and xylitol gum. She got rid of her regular toothpaste and switched over to baking soda to brush her teeth. When the dentist x-rayed her teeth, he saw that the cavities were much smaller than a year ago. He told her instead of drilling her teeth to fill the cavities, he was going to monitor them. I also read about a woman who had a lateral crack on her tooth that went away in a year after she stopped using fluoridated toothpaste and brushed her teeth with baking soda. I further learned that fluoride and glycerin in our toothpaste prevent our teeth to naturally heal itself and remineralizing. These sequence of events compelled me to start looking into health affects of fluoride. I learned that a fluoride Harvard study showed that fluoride may have an adverse affect on the neurological development in children. Those who lived in high fluoride areas had "significantly lower IQ than those in low fluoride areas". There are other studies conducted, you can read more at Infowars. So now there are studies with different results. The United Kingdom study commissioned by the government and published in the British Medical Journal in 2000 showed no adverse health affects while the Harvard study showed possible neurological development in children. I don't use toothpaste anymore but I still drink boiled tap water. Since there is fluoride in my tap water, I can not completely avoid it. 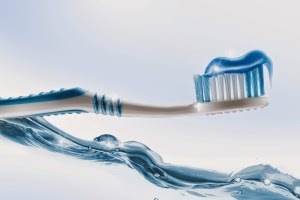 I can, however, choose a fluoride-free alternative to brush my teeth. I've gone to the simpler and natural way of brushing my teeth: baking soda. I will post about brushing with baking soda in my next post so stay stuned.